Photograph by William Claxton/Courtesy of Demont Photo Management, LLC. NEW YORK.- Christies International Motor Cars is delighted to announce the sale of the 1963 Ferrari 250 GT Berlinetta Lusso, chassis number 4891 once owned, driven and raced by Steve McQueen, one of the worlds most important pop icons. This highly-desirable car will be sold at Christies International Motor Cars 2007 flagship auction that takes place on Thursday, August 16 at the Monterey Jet Center in California (estimate: $800,000-1,200,000). McQueen started car collecting after his first acting paychecks in the early 1950s, purchasing an MG. His interest developed, owning Porsches, a Siata, Jaguar and a Shelby Cobra  and then in 1963, he purchased this Lusso, his first Ferrari. McQueen special ordered the stunning combination of marrone, a medium-brown metallic paint with an elegant beige leather interior from Otto Zipper Motors in Santa Monica. Balanced against the Borrani wire wheels and a Pininfarina body sculptured by renowned coachbuilder Scagletti, the car is arguably one of the most attractive Ferraris ever-built. 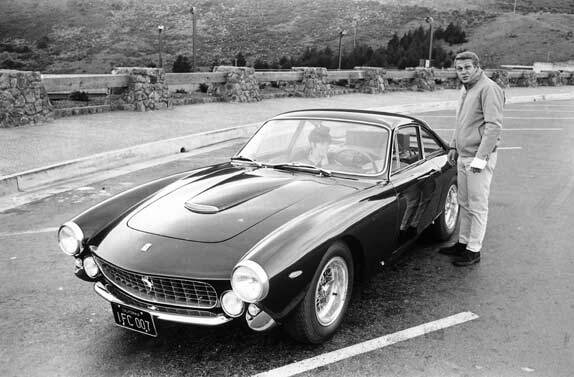 Enjoying the car for a decade, McQueen traded the Ferrari in 1973  but left his stamp on the McQueen Ferrari Lusso, which was acquired in 1997 by respected restorer Michael Regalia. Mike decided to restore the car back to its original condition, exceeding 4,000 hours of work. The result is the worlds finest surviving example of a 250 GT Berlinetta Lusso  a car that is often referred to as the cousin of the legendary Ferrari 250 GT SWB and 250 GTO. Accepted in to the prestigious Pebble Beach Concours dElegance, along with numerous other awards and trophies, the car and its reception by the car collecting community illustrate that Mikes original intentions were well surpassed. Along with the hugely desirable provenance from the King of Cool, this automobile is a truly exceptional motor car and its sale will be one of the major highlights of the long weekend of enthusiast events surrounding the annual Monterey Historic race meeting and Pebble Beach Concours dElegance this coming August. Auction: Exceptional Motor Cars at the Monterey Jet Center, August 16, 2007. Viewing: Christies New York (April 27 - May 9 & May 24  31); Greenwich Concours dElegance, Connecticut (June 1  3); Monterey Jet Center, Monterey, California (August 12  16).